We're featuring "Slice of Life" conversations with Autistics of all ages -- kids through adults -- throughout April's Autism Acceptance Month. 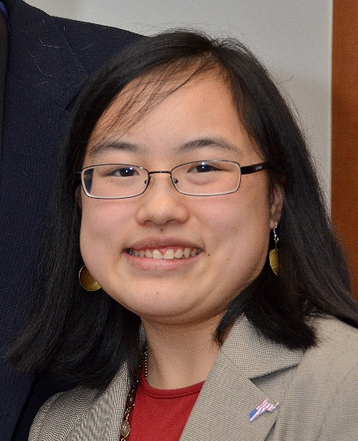 Today we're talking with Lydia Brown, who is eighteen, attends Georgetown University, and is an intern at the Autistic Self-Advocacy Network's national office. I am a neologist, a writer, and a student who gorges frequently on hot chocolate. I have very hypersensitive hearing, and I also learn languages very quickly. Not so fast as to be on par with Daniel Tammet, but much more quickly than the average person. According to some native Spanish speakers, I've lost any trace of an American accent in my spoken Spanish. I can also memorize numbers relatively easily. Knowing that I am respected as a person, or that my ideas are respected, or that my work is respected -- whether my advocacy work or my creative writing or anything else whatsoever. Whenever people attempt to de-legitimize my voice on the basis of assumptions about my abilities or challenges, make personal attacks on my character or personhood, or otherwise treat me as less than human and less than a peer. But most egregious of all is when someone does one of those things to someone else and I have to witness it. I have intense academic and personal interests in worship in Sufism, Sufi music and poetry, Islam and American politics, inter-religious dialogue, post-9/11 national security policy, national security and public policy, religiously justified terrorism, twentieth century Serbia and the former Yugoslavia, the etymology of names, autism and public policy, the autism rights movement or neurodiversity, and my own writing and characters -- I am currently working on my fifth and sixth novels simultaneously. I like to meet friends over lunch or attend scholarly lectures or other planned events with friends. Integrity, faithfulness, unconditional acceptance, trustworthiness, and respect. I hate some of my sensory issues, especially around certain types of olfactory and tactile input. I also hate allergies. And massive amounts of homework. Being with the people I love, monologuing about one of my special interests to an engaged audience, or writing.